This is a dirty 5.8, a good 5.10a, or an awesome 5.10c depending on which pitches you start or finish on. We consider the 5.10a variation the standard route because the 5.8 original route is much less classic and more runout. 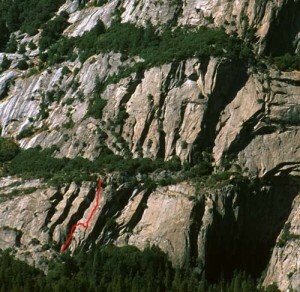 Unlike most Five Open Books routes that ascend big corners, The Surprise mostly climbs splitter cracks on a clean face. This route is usually uncrowded. It's tricky but possible to pull through most of the crux sections on gear. Which SuperTopo guidebooks include a topo for The Surprise?